Mihaela Precup is an Associate Professor in the American Studies Program at the University of Bucharest, Romania. Her main research interests include American graphic narratives, memory, trauma and autobiography studies. Her most recent publications are “That Medieval Eastern-European Shtetl Family of Yours”: Negotiating Jewishness in Aline Kominsky Crumb’s Need More Love (2007), Studies in Comics (December 2015) and “Bad Girls from Outer Space: Brian K. Vaughan and Fiona Staples’s Saga and the Graphic Representation of Subversive Femininity” (with Dragoş Manea) in Bad Girls and Transgressive Women in Contemporary Television, Fiction, and Film. Ed. Julie A. Chappell and Mallory Young. New York: Palgrave Macmillan (forthcoming, 2017). She is co-editing (with Rebecca Scherr) two special issues on Sexual Violence in Comics of The Journal of Graphic Novels and Comics (Taylor and Francis, forthcoming, June 2017 & June 2018). 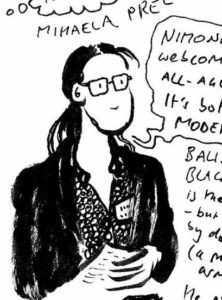 She is currently working on a monograph tentatively titled Picturing the Father: Memory, Representation, and Fatherhood in Autobiographical Comics (under contract with Palgrave Macmillan). ©2015 Mihaela Precup. All Right Reserved.